Wheels and tires are both made of composite materials with some degree of imbalance. TWheel balance is affected by many factors, such as uneven weight distribution on tires and rims, uneven tire wear, and rim dents from hitting a curb or pothole. We often find that a damaged shock absorber is causing poor tire balance. Regardless of what is causing your tire imbalance issue, as the weight becomes increasingly imbalanced over time, the severity of the uneven weight can cause a shaky feeling or vibration while you are driving. If left unattended, the vibration will eventually become a safety concern as your tires face a blowout risk. You should never risk getting left stranded when United Nissan of Las Vegas offers a hassle-free and convenient Nissan Tire Balance Service. How to know if my tires are out of balance? 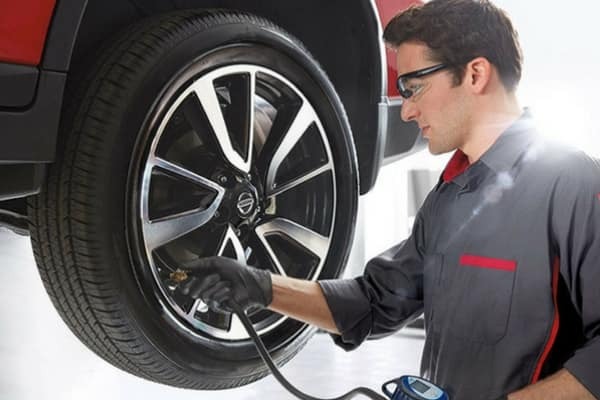 What Happens During a Nissan Tire Balance Service? Tire Balance Service is all about creating even weight across all of your wheels to give you a smooth driving experience, to protect your safety, and to extend the life of your tires. The first step of service is removing your wheels with tires and placing each one on special equipment that analyzes wheel weight as it spins. The special device can detect uneven weight and tells our expert technician exactly where to add weight to your rim to create perfect tire balance. This means an expert technician will use the equipment to attach a small metal weight so that when your wheels spin, they are perfectly balanced to create a smooth driving experience. When each tire is removed, the expert technician will inspect each one to ensure your tires are able to provide you with the safety that you expect.